We’d love your help. Let us know what’s wrong with this preview of The Slow Cook Book by Heather Whinney. To ask other readers questions about The Slow Cook Book, please sign up. I love using my slow cooker and it gets a workout at least a couple times a month in the summer, in the winter it's much more often. So I am always on the hunt for new and interesting recipes to try out. I tried the Moroccan Chicken Baked with Spices, with a couscous side dish. Man, was it ever good! The chicken fell apart from the bone, so you had to be careful, but with the tomatoes, spices and apricots, it was a nice sweeter flavor. Now don't think it was so sweet, it had 6 onions in it, along I love using my slow cooker and it gets a workout at least a couple times a month in the summer, in the winter it's much more often. So I am always on the hunt for new and interesting recipes to try out. Man, was it ever good! The chicken fell apart from the bone, so you had to be careful, but with the tomatoes, spices and apricots, it was a nice sweeter flavor. Now don't think it was so sweet, it had 6 onions in it, along with salt to give it enough bitterness to balance it out. It really was a flavorful dish, so plain couscous with a little olive oil is all you needed extra. Best part is, it was a hit with the hubby too. He's a picky one, especially with anything tomatoes, which is hilarious being he is Italian, but he found it quite enjoyable and even commented a couple of times with a mmmm. This cook book is a winner! Comfort food with a sophisticated edge. Instructions include the slow cooker method and the stove top method for each recipe. There's a nice introduction that demonstrates preparation techniques, and a section called "The Slow Cooking Pantry" that lists ingredients, by category, used in the recipes, from flavorings to canned and jarred ingredients to sauces and stocks, beans and spices. Recipies I tried were flavorful and not difficult to make. The Slow Cook Book features recipes for both slow cookers and more traditional slow cooking methods. There are recipes for soups, stews, casseroles, curries, chilis, pot roasts, and even a few desserts. This is a really good cookbook. I don't use my slow cooker as much as I should, but this book has encouraged me to use it more often. I love that there are so many delicious sounding recipes to try. I made a number of them so far and each of them has turned out pretty good. 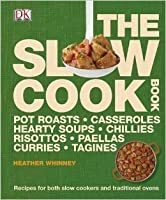 The book starts off wi The Slow Cook Book features recipes for both slow cookers and more traditional slow cooking methods. There are recipes for soups, stews, casseroles, curries, chilis, pot roasts, and even a few desserts. The book starts off with an introductory section that includes: types of cooking, pantry essentials, choosing ingredients, and some cooking techniques. I particularly like the photos in this section. The next section is called "Recipe Choosers". It sort of neat, but I'm not sure how useful it's going to be. Along with the recipe titles, there are photographs, page numbers, and cooking times sorted by the main protein used. However, this section doesn't have include all of the recipes in the book. I'm confused as to why the author chose to highlight these, but not others. Also, some of this information is already presented in the index, albeit, not as beautifully. Oh, well. It's pretty to look at. On to the recipes. Each of them features: the number of servings, the recommended maximum freeze time (if applicable), instructions, prep time, and cooking time for both slow cookers and traditional slow cooking methods. Some of the recipes have photographs of the finished dish, however, sadly, many of the recipes don't. Speaking of photographs, the ones in this book are quite nice. Not ultra-contemporary mind you, but mouth-watering, nevertheless. It's odd, though, that there's only one photograph of a slow cooker. And there's no food in it. All of the other photos (for cooking techniques and for presenting the dishes) are either on plates, bowls, pots, or dutch ovens. I just find that a bit strange for a book about cooking in a slow cooker. The instructions are laid out nicely and quite easy to follow. There are a number of recipes that have been labelled "healthy". However, I couldn't find anything to tell me the criteria for this designation. Are they low fat? High fibre? High protein? That would be nice to know. The book also contains a table of contents and index. Recommended. If you use your slow cooker all the time, you'll find some new interesting recipes to try. If you don't use your slow cooker a lot, this book will likely inspire you to dig it out and plug it in. For more information about this book, please visit Amazon's website. I'd like to thank Chris at DK Canada for this review copy. 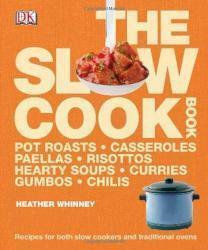 The Slow Cook Book by Heather Whinney, Dorling Kindersley (DK), ©2013. ISBN 9781553632191(Soft cover), 352p. Excellent slow cooker book. This is a major step up from the usual 5 ingredient collections. No processed or packaged food is required to make these meals, and the flavours are complex, balanced and sophisticated. Winners so far for me are the chicken mole and chickpea tomato tagine. The intro also features fantastic photos of how to prepare ingredients and slow cooking theory. Looking forward to trying more of these suppers! A really good slow cooker recipe book. I made 2 recipes from this book and they both were very good. DK books always feature lots of high quality photos and the instructions for the recipes were easy to understand. There were also instructions given to make the recipe in a traditional way not using the slow cooker. Some of the ethnic recipes featured ingredients that might be difficult to acquire in non urban areas. I would recommend this book for adventures chefs. This book was interesting, but not very practical for a rural Midwest home cook. There were tons of ingredients I'd have to special-order in, and a LOT of things my kids are not going to eat. I bet some of these recipes would indeed taste good, but the long unusual ingredient lists rule out my trying many of them. Wonderful cookbook for the cook in a urban area with the opportunity to purchase rare foods and spices. You have to be willing to try new foods and risk expanding the the palliate of your families taste buds. I did find several recipes worth trying and learned alot about the technique of slow cooking. Fanciest slow cooker cookbook I've ever seen - but everything looks straightforward and simple enough to make! I would totally buy this book. I want to make everything in here. This is a nice beginner cookbook. But it doesn't have anything new or ground breaking. It would be a good gift for a young adult. I'm making my second dish from the book today. Last week's was the pork roast with butternut squash and it was fantastic! Today is chicken fricassee and it smells great! British and pretty fancy for a crock pot book. Nice photos.